Viewing rare gems on our doorstep Found only on the clay slopes and flats of the northeastern Cape Peninsula, Moraea aristata survives in the wild in one single location near the Liesbeek River in the Two Rivers Urban Park. Moraea aristata (Blue-eyed Uintjie or Blouooguintjie in Afrikaans) is a critically endangered species unique to the Cape. 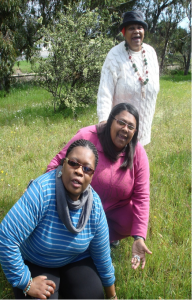 Staff from the Village Todds Pre-primary School in Maitland Garden Village took the opportunity during September to visit the South African Astronomical Observatory (SAAO) and observe the large and striking flowers of this winter-flowering bulb. 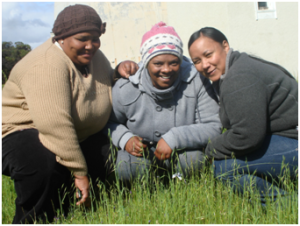 The principal, Carol Booysen, and her team, are passionate about teaching children from a young age about nature. They are familiar with this “peacock iris”, as students from the UCT IES Abroad programme recently developed a mural and lesson plans for their school, illustrating this Moraea, (along with the western leopard toad, and the Cape Monarch Butterfly). This was however the first time any of the teachers had seen the peacock iris living in the wild, and right on their doorstep. Moraea aristata flowers for approximately three weeks in September, and walking tours can be arranged through the SAAO over this period. 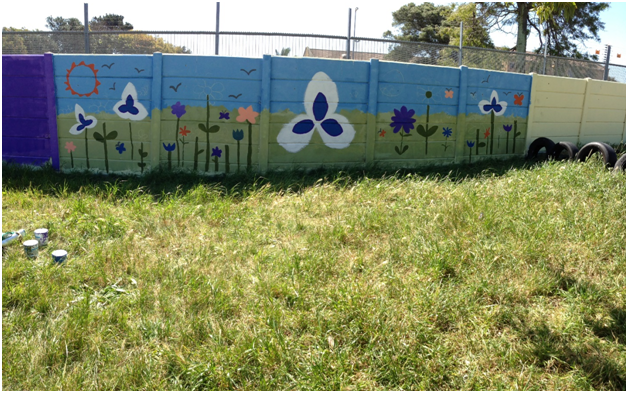 Part of the mural at the Village Todds Pre-primary School, Maitland Garden Village, painted by UCT IES Abroad students, illustrating the critically endangered Moraea aristata.